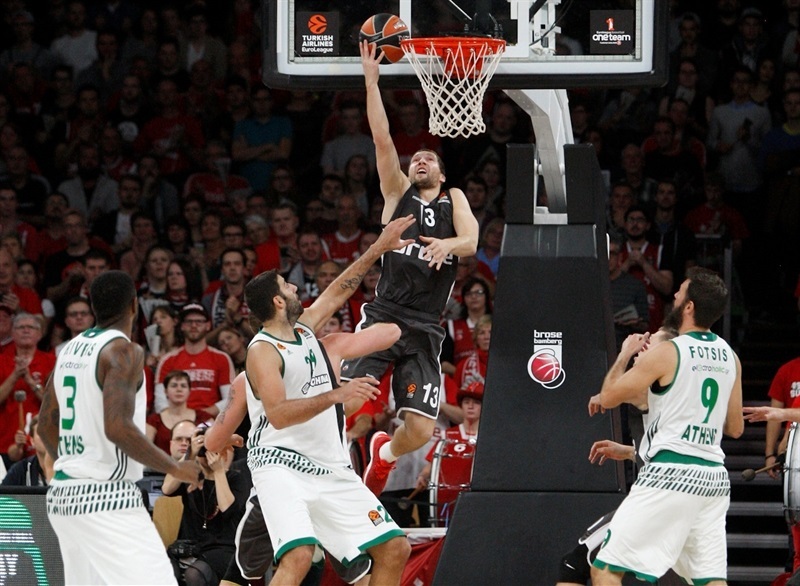 Panathinaikos rallies and gets game-winner from Calathes! 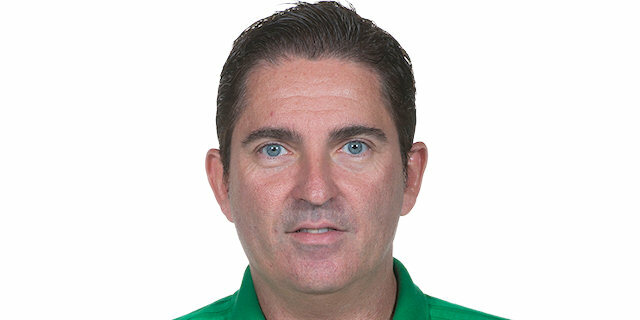 A dramatic 0-11 closing run on the road gave Panathinaikos Athens an amazing 83-84 victory over Brose Bamberg in its first game under new head coach Xavi Pascual on Wednesday. Nick Calathes lost a triple-triple double when his teammate missed a layup with under 10 seconds left, but Calathes got the rebound and put it back through for the game-winner! 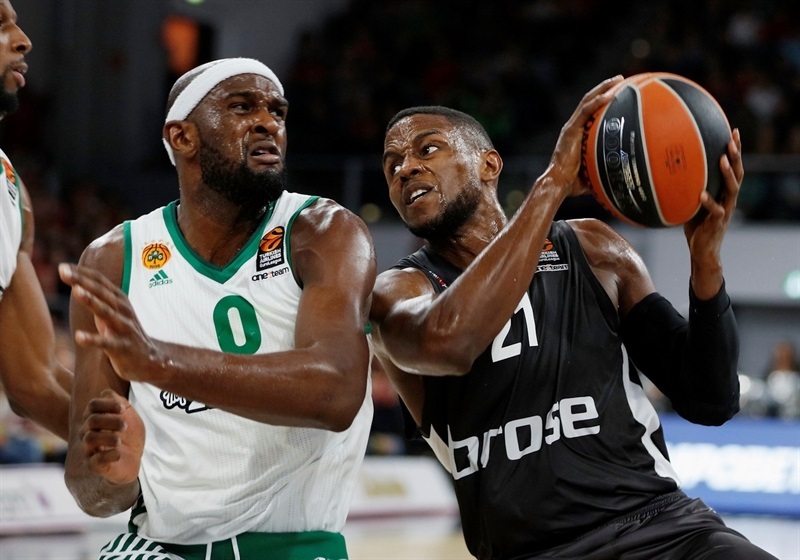 Panathinaikos improved its record to 2-1 while Bamberg suffered its second one-point defeat to go 1-2. 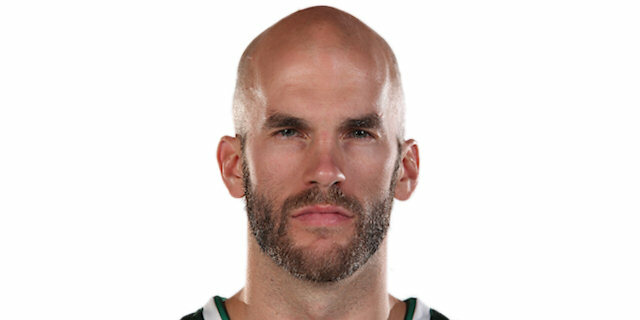 Calathes finished with 13 points, 11 rebounds, 9 assists and 3 steals to lead the Greens, who also got solid shooting from the arc. K.C. Rivers made 3 of 5 from downtown for 18 points and James Feldeine made 4 of 6 to score 16. 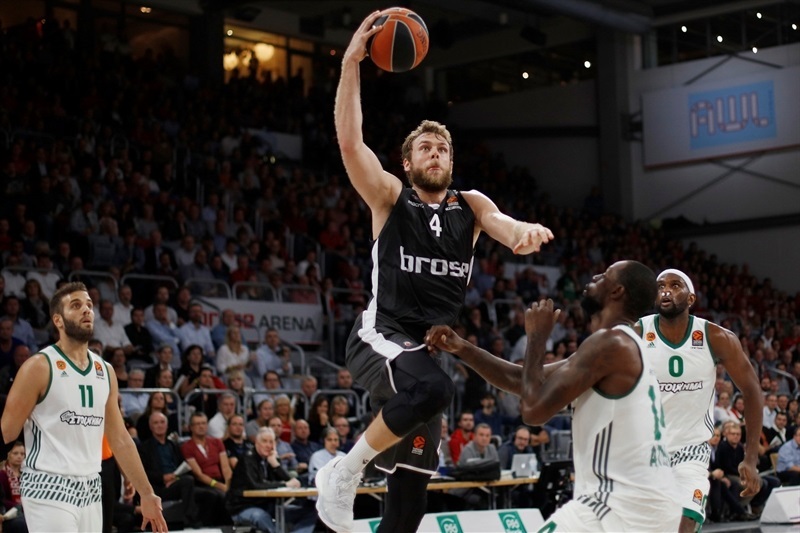 Nicolo Melli was 4 for 4 from deep and led Bamberg with 17 points. Janis Strelnieks followed with 16, Nikos Zisis with 13 and Darius Miller with 12 points. 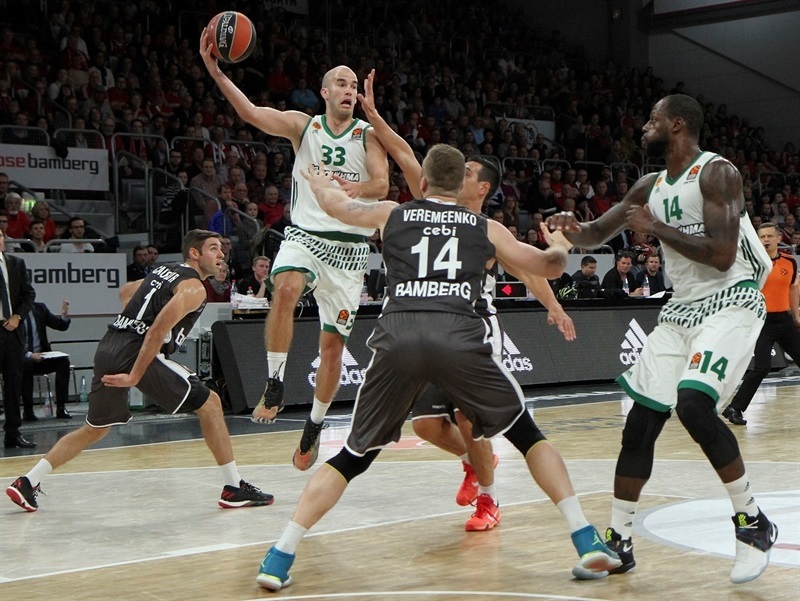 Leon Radosevic marked his first appearance of the season with a three-point play to open the scoring for Bamberg but Feldeine's 7 points in a row and 5 early assists from Calathes put Panathinaikos in charge. Despite Melli striking twice from the corner, the visitors led 15-20 after 10 minutes. 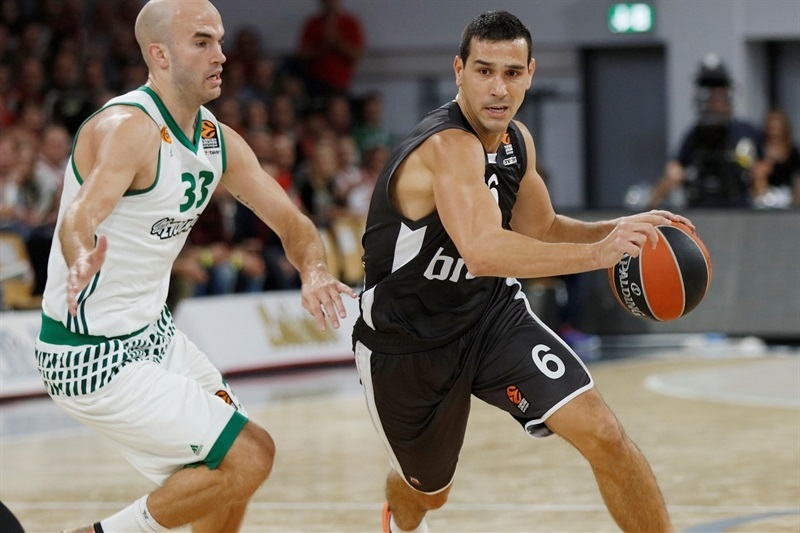 Patrick Heckmann's three-pointer and inside baskets by Strelnieks filled a 7-0 run as Bamberg jumped ahead 22-20. Rivers helped Panathinaikos surge again to 22-28 before Maodo Lo made his first EuroLeague points from the arc as Bamberg pulled within 27-28. A great team play freed Rivers for one three-pointer and he created another on his own as Panathinaikos ran ahead again. When Feldeine struck from downtown, too, the visitors were on their way to a 37-42 halftime lead. Bamberg erupted after halftime with Zisis, Strelnieks and Miller all taking turns in a 17-2 run that resulted in a 54-44 lead for the hosts. 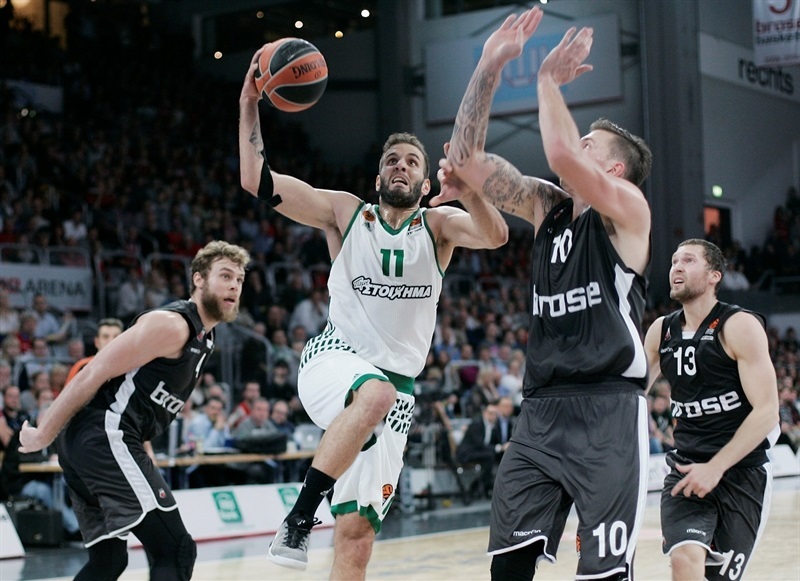 Calathes and Rivers settled down Panathinaikos before Ioannis Bourousis tied it again, although Bamberg clung to a 63-62 edge after 3 quarters. Triples from Strelnieks and Fabien Causeur threatened to see Bamberg run away early in the fourth, and they finally did on a three-point play by Zisis and a jumper by Daniel Theis at 83-73 with 3 minutes left. 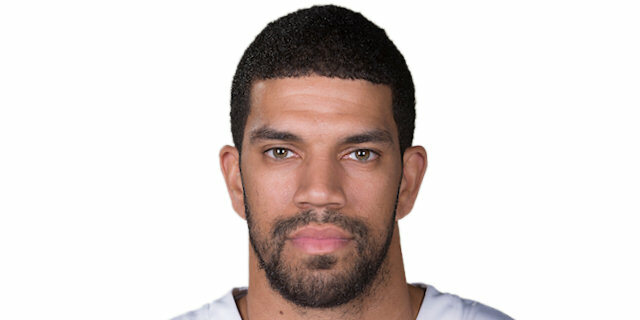 In short order, Rivers responded with an acrobatic shot and free throw and Calathes found Gist for a slam-plus-free throw, and suddenly it was 83-79. 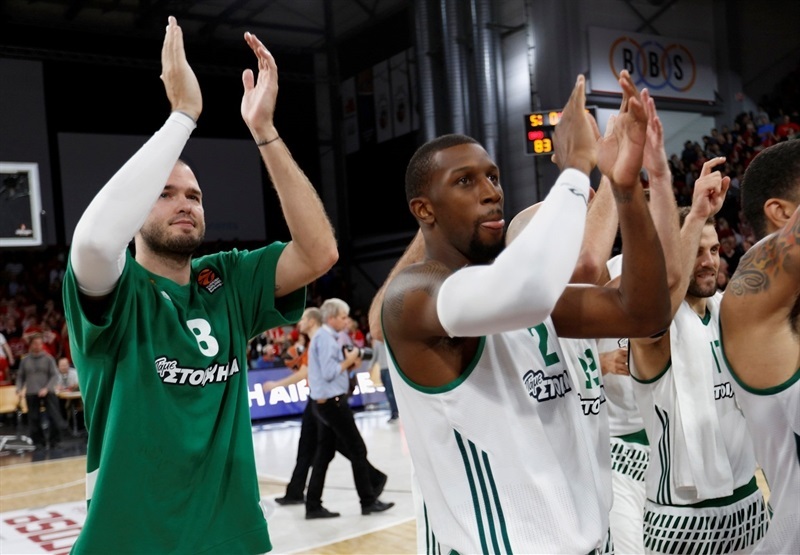 With 1:31 left, Gist passed to Feldeine in the corner for his third three-pointer while the Panathinaikos defense shut down Bamberg cold. Panathinaikos inbounded with 8 seconds left, but Rivers couldn't convert a pass from Calathes, who chased the rebound and put it back up in a crowd for the game-winner! 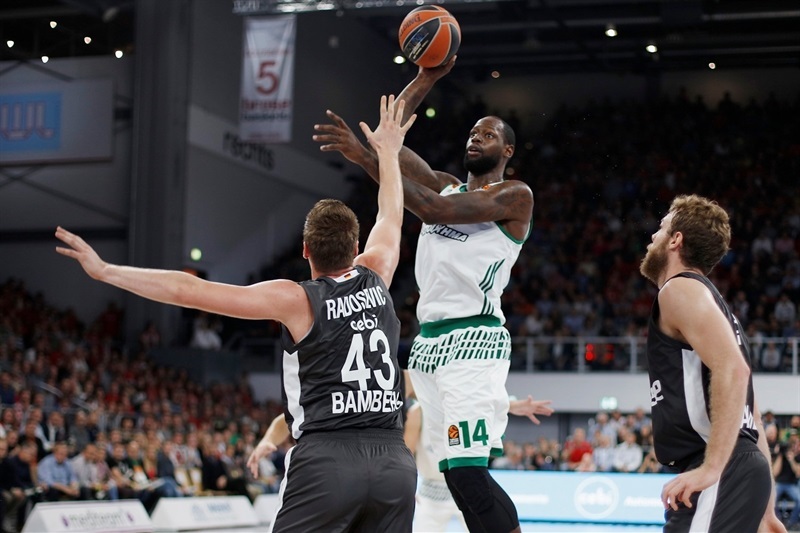 Panathinaikos goes home to play Crvena Zvezda mts Belgrade on Friday in Round 4, while Bamberg has to pick up the pieces in a road trip against FC Barcelona Lassa. "First of all, I am very happy with this win. I think it was a great game. Obviously, we need to improve a lot of things, but tonight we believed for 40 minutes and in the end, we won the game. 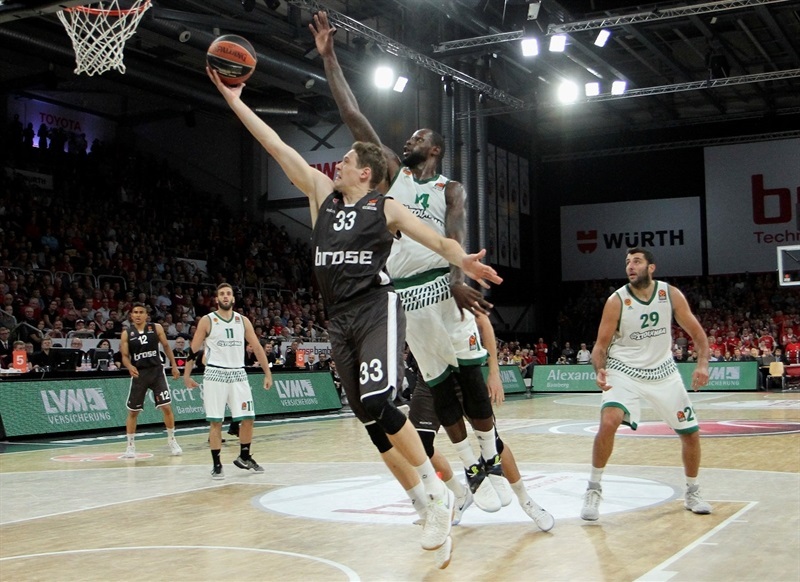 Maybe sometimes we played bad defense, but tonight, we know Brose Bamberg is a great team, tremendous at home, and it was difficult to play good defense against them." "It was a great win for us. We needed the win for our confidence. It showed we have heart. It showed we are a good team on the road, not only at home. It's tough to beat Bamberg here with their fans. I'm happy we came out with the win." "Heart. Never give up. That's what this team's about. We've been through a little bit early in the season. But we just battle back and fight back and we have a team that believes."